If you have a swarm of honey bees you want removed from your property, one of our beekeepers may be able to help you. BEFORE you contact us, it is essential to know which type of insects you have, because we only deal with honey bees. It is very common for people to confuse wasps and bumble bees with the honey bee. If you have a bumble bee colony, the Bumblebee Conservation Trust has advice should you absolutely have to move one. Compare what you have on your property to the pictures above. Swarming is the way honey bees make new colonies. The new colony leaves the mother hive and rests temporarily whilst searching for a new place to live. Typically the swarm rests in a tree or bush (as in the picture above) for anything between an hour and a couple of days. A swarm will normally move on and the bees in a swarm will ignore you unless they feel you are threatening them. However a hanging swarm should be removed by a beekeeper as, if it does move on, it may well end up in a chimney or other unsuitable location. Never call the 999 services unless it is an emergency – this is very unlikely. 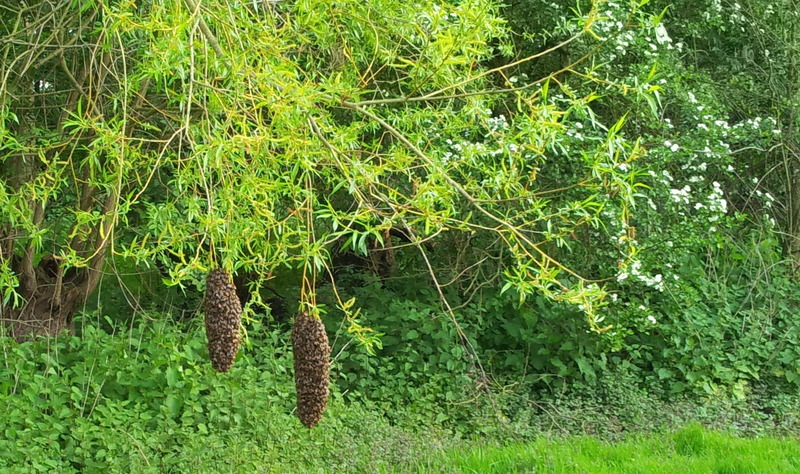 If you have a swarm of honey bees, contact one of our swarm controllers who may be prepared to send someone to remove the swarm if it is accessible. Beekeepers may charge £30 for this service in order to cover for the various expenses incurred in re-locating a swarm. Do not call us if you have wasps – contact your local council or exterminator. ONLY if you have a swarm of honey bees should you contact one of our swarm collectors.